There are two congregations which meet every Sunday. A traditional ‘Holy Communion’ service with hymns accompanied by our beautiful organ. Together we listen, respond and are changed as God speaks by his word.The congregation enjoys morning tea together at the conclusion of the service. A relaxed modern service for all the family, with modern songs led by our contemporary music team. Together we listen, respond and are changed as God speaks by his word. The children join with the adults for the first part of the service, which includes fantastic children’s talks and songs. The children (Years K-8) then head out to our children’s programme led by our well-trained children’s team. A creche is also provided for Pre-School children. After the service, we enjoy sharing a morning tea together. We would love to be able to meet you at either of our services! Everyone is welcome – no matter what your background or current circumstances look like, we would love to welcome you to St Andrews. We are a group of people who seek to be radically changed by Jesus Christ. … a glimpse of our launch in October 2016. Each Sunday we meet for a contemporary style church gathering which combines Scripture readings, authentic prayers and good music. The centre piece of our time together is always the sermon where we teach and apply God’s authoritative Word to our lives in an accessible and relevant way. 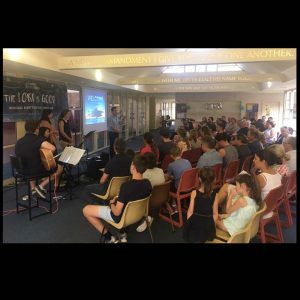 Regularly we host Connect Nights, which are Sunday nights with a special focus on visitors, newcomers and those seeking to find out more about God. On these nights we hope members of the local community join us at church and we encourage all our members to invite friends and family along too. We have regular social events throughout the year and go away together for conferences and weekends away. By God’s grace, our diverse group of high-schoolers, uni students, young workers and other adults have developed into a real community where young and older meet together, encourage each other and share their lives together. For latest information find us on Facebook and Instagram @wahroonganightchurch. We meet at 6pm every Sunday night in the foyer. For more information please contact Pete Tong (pete.tong@standys.org.au).